Our site was visited about 66,000 times this year, and the busiest day of the year was May 1st with 469 views. That day’s post was “Solar Roads: the Science, Potential, and Lingering Questions” by doctoral student Julianne Troiano. We wrote 49 new posts this year altogether (this one makes 50) and readers visited our site from 168 different countries! We were proud to have three blog posts this year recognized as ScienceSeeker Editor’s Picks: Joel Pedersen’s post, “Not Your Daddy’s Sunblock – Why Thick, White Sunblock is a Thing of the Past,” was selected for the week of Sept 28-Oct 4; Sunipa Pramanik’s post, “Using Nano/Micromachines to Help Clean Up Oil Spills,” was selected for the week of Nov 16-22, 2014; and Alicia McGeachy’s post, “What do Gold Nanoparticles Have to Do with Wrinkly Skin?” was chosen on Nov 25, 2014. The CSN’s social media presence is also continuing to grow: we now have 1,595 likes on Facebook and 658 followers on Twitter, and we are always looking for more and better ways to connect with interested colleagues and members of the public. Regardless of whether you tweet or FB or use Tsu (should we start using Tsu? ), if you are reading this post, THANK YOU for being part of our community! Please leave us a comment below – what did you think of our public outreach efforts this year? What sustainable nanotechnology topics do YOU want to read about on Sustainable Nano? 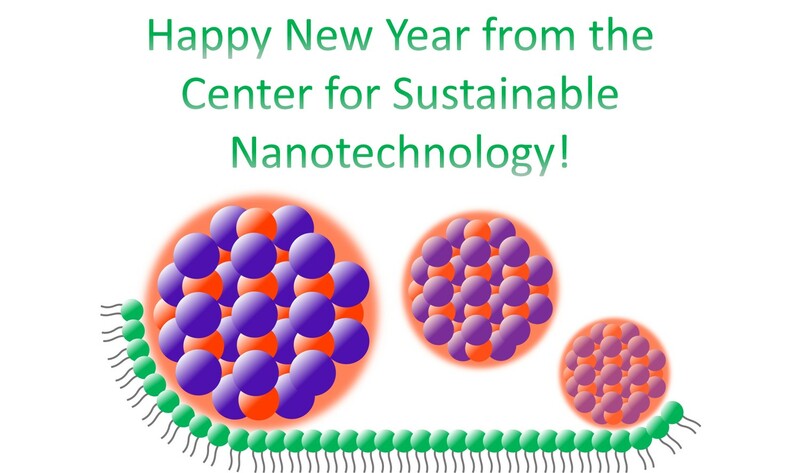 As for 2015, our plan is to continue bringing you thoughtful, entertaining, and informative posts about nanotechnology and sustainability from our Center faculty, student researchers, and guest bloggers. Upcoming posts include a New Years greeting from our Center Director, an explanation of how we study cell membranes using lipid bilayers, a report from a student journalist who visited one of our Center labs, and a description of how the importance of particle charges can be explained using milk. Meanwhile, as our contribution to tonight’s festivities, please enjoy this post from our archives by faculty member Gustavo Dominguez about nanomaterials making their way into fireworks.